"BAT" Basic Aid Training...WEBELOS ReadyMan! Our youth BAT Instructors provided the American Red Cross BAT "Basic Aid Training" program to over 400 area 4th and 5th grade boys and girls last year. We are off to set a new record for this year. BAT is a truly fun class designed especially for our WEBELOS and Junior Girl Scouts. The American Red Cross BAT program teaches accident prevention and beginning first aid skills to fourth and fifth grade boys and girls. Our all day program meets most of the requirements for the WEBELOS Readyman badge and is fun too. The BAT class is made up of 12 modules each demonstrating a first aid, accident prevention or safety skill. The class begins with First Thing First which explains what to do in an emergency. The class gets acquainted with the American Red Cross child mannequin "Junior" to learn the rescue breathing skill. The All Choked Up module teaches abdominal thrusts, Ouch teaches minor wound and burn care, Famous Fire Facts reinforces basic fire safety, Poison Patrol discusses how to prevent and treat poisoning. Other modules such as Water Whiz cover basic water safety including an introduction to BSA safe swim defense. Safe Wheels is a bicycle safety module. Just Say No, Cautious Kids and Lost and Found provide the boys and girls with age appropriate information on ways to stay safe and avoid dangerous situations. 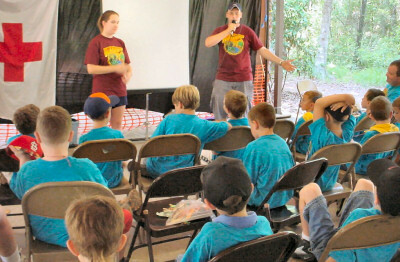 The BAT class is a combination of videos, demonstrations, skill practice, hikes, outdoor activities, games and contests. Lunch is always good too! Guest speakers often stop by. The BAT program is definitely not a boring lecture class! The American Red Cross certified teenage instructors keep it interesting and keep the class moving. The cost for the BAT class taught by The NBO Scout Training Team is $20.00 per person which includes a BAT workbook, a special embroidered patch and completion certificate plus a great lunch in the Camp Strake Conference Center Dining Hall. Check-in for our BAT class begins at 8:00 AM and the class starts promptly at 8:30 AM. We coordinate our class completion time to coincide with our adult CPR/FA class which is usually around 4:00 PM. 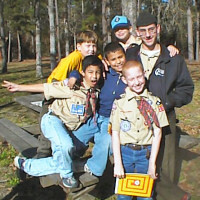 The Conference Center is located at Boy Scout Camp Strake which is just south of Conroe, Texas. Please read our adult supervision policy. Our staff will do every thing we can to assist you with this requirement. Remember, advance reservations are required and most of our class dates fill up fast. Please email us if you need to add to your reservation. We will try very hard to accommodate you and your WEBELOS. We can usually work it out. The reservation deadline is 9:00 PM Monday evening the week of the scheduled class. Please register your Scouts on-line. We do have registration forms that can also be down loaded from our "Resources" page. Use the forms to get your information ready to enter on-line. Please email us if you are having difficulty registering and we will get your group signed up. Please make checks payable to "NBO Scout Training Team". You can pay Saturday morning at check-in. Make sure you have copy of your reservation form or email confirmation with you at check-in. Reservations are usually acknowledged by email by Tuesday before the scheduled class date. BAT classes are held in conjunction with our adult CPR and First Aid training. 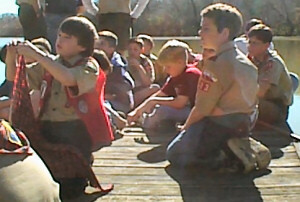 Cub leaders and parents can take advantage of the adult training while the WEBELOS participate in the BAT class. Our Boy Scout and Girl Scout instructors actually run the BAT class. Star, Life and Eagle Scouts and our Girl Scout staffers are great roll models for our younger Scouts. Our BAT class is a fun experience.